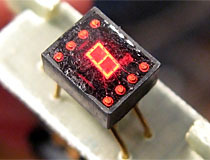 By the beginning of the 1970s, LED indicators started to evolve into LED displays. 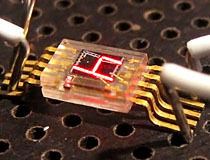 The earliest LED displays are constructed of dozens of small indicator-style dies, while later displays are constructed from more complicated multi-segment dies, eventually settling on the now standard practice of using a single LED with a diffuser for each segment. 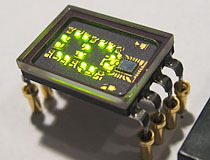 Simple displays were quickly joined by LED intelligent displays, which incorporated integrated circuits directly into the LED package, allowing for a progression of smaller and more complex LED devices. The beginning of the 1970s also saw the introduction of liquid crystal technology, which would ultimately displace LED displays in many applications. Invented at RCA by George Heilmeier, the earliest LCD devices used a milky white liquid crystal material that was prone to deterioration, which was quickly replaced by newer and more stable LCD formulations. 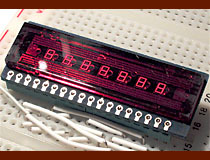 The MAN-1 is generally considered to be the world's first production seven-segment LED display. 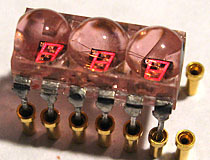 Following the introduction of the MAN1, the now-familiar seven-segment LED rapidly took over the world, wiping out the demand for Nixie tubes, Minitrons, Panaplex displays, and many other display technologies in a single blow. Each segment of the MAN-1 is made up of two silicon wafers, which each contain four diode elements. With the inclusion of a decimal point, the entire display contains 57 separate light emitting sectors, which is quite a lot compared to modern displays which typically only use a single diode for each segment, or even a single etched die for each character. The MAN-1's first-generation diode technology results in a very dim display, but the virtual immortality of LED technology was a drastic improvement over the incandescent Minitron displays and complex gas-filled devices it was designed to compete with. Soon after the release of the MAN-1, Monsanto introduced a modified version, the MAN-1A. The MAN-1A is identical in functionality and basic construction to a standard MAN-1, but has a dark red epoxy case which does a great deal to hide the display's ugly internal construction. 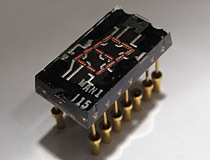 The MAN-3 is generally considered to be the first surface mount seven segment display ever made. This display is tiny: digit height is only 3mm and package dimensions are 6mm by 4mm. The unit has ten gold plated pins for mounting, and the two center pins are shared grounds. 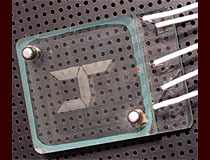 The earliest versions of this display are made using a single die which was encased in a water clear epoxy package. 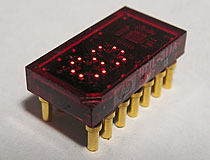 Later versions are encased in red plastic and have a significantly different internal construction, which makes use of a separate die for each LED segment. 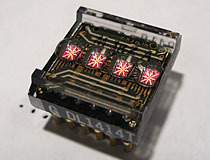 The single die version of this part has segments which are divided into 5 small light emitting sectors, which gives the display a distinctive quasi-bitmapped appearance when viewed with the naked eye. Strangely, the decimal point die does not appear to be a MV1 die, a departure from Monsanto's earlier LED products. This unidentified Litronx display appears to be a direct competitor to the Monsanto MAN-4; it has the same pinouts and utilizes a similar reduced-die construction. To counteract the laughably small digit size resulting from the use of single bar elements for each digit, Litronix has equipped this display with a large built-in magnifier that dominates the front of the package. Each LED bar element has four circular active areas arranged along its length, which gives the display its bitmapped appearance. 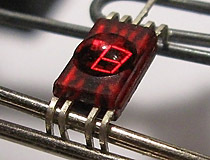 The ball bond wires are attached to each die via oblong pads located between the active LED areas. We have been unable to fully identify this part, but suspect it must date from very early in the history of LED production based on an extremely crude construction quality that leaves one wondering if these displays were made under duress in some sort of imaginary LED gulag. 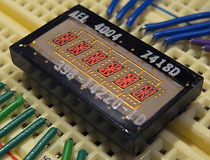 The 5082-7300 and its descendants are some of the most popular intelligent LED displays ever produced. First introduced in 1972 as a lower cost replacement for the 5082-7000, the 7300 makes use of a smaller package and false-bitmapped 4x7 array, which reduces the number of LED dies needed for each device. Each display has an integrated BCD decoder that accepts 8421 BCD logic, as well as a built in latch. 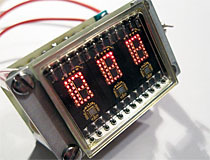 Initially this display was made in 3 different versions with different capabilities, including the 5082-7340, which could display hexadecimal characters. 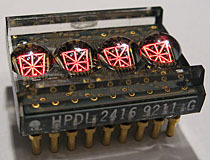 HP also produced the 5082-7304, an overflow indicator which contained no logic but was visually compatible with other displays in this series. Ironically, the 5082-7304 is much harder to find than the other displays in this family, despite its limited utility. 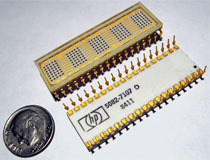 Hewlett Packard also produced a number of military grade derivatives of the 7300, which were encased in hermetic glass and ceramic packages. 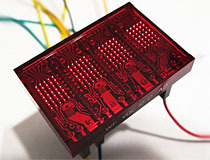 Two such examples are the 5082-7359, a red LED device, and the HDSP-0962, which makes use of green LEDs. More than a mere display, the DL2416 is an entire seven bit ASCII decoder, character generator, and four digit alphanumeric display in a single package. The display is made up of four seventeen segment dies mounted under a plastic magnifier, with the control circuitry mounted to the underside of the display and covered with an epoxy coating. The display has its own memory registers, and will remember character data without processor intervention.The 2416 differs from its close relative, the 1414, in that it includes cursor position and blinking functionality that preserves the contents of display RAM. This display was produced by several different companies, though the Hewlett Packard version (shown in the thumbnail) is by far the most visually appealing. 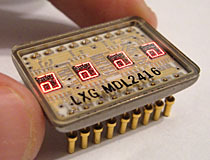 The DL1414 is a smaller, less capable version of the well known DL2416 alphanumeric LED display. 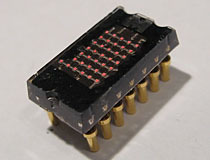 The DL1414 contains a 7 bit ASCII decoder, display ram, and character generator that provides sophisticated logic control of its four alphanumeric digits. The 1414 lacks the cursor generation and display blanking of the 2416, but the omission of the pins for those functions results in a display that is both smaller and easier to drive than a 2416. 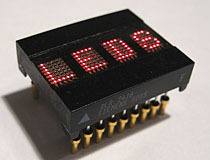 This LED display was manufactured by several different companies including Litronix, Siemens, and Hewlett Packard, though the Litronix version of this part is by far the most common. The DLR2416, manufactured by Siemens, is a pin-compatible drop-in replacement for the DL2416 and HPDL 2416 intelligent displays shown above. Though the DLR2416 has all of the decoding and memory capabilities of the DL2416, it replaces the 17-segment single-digit dies of the DL2416 with 5x7 character matrices constructed of individual dies. This functionally enhanced display allows for the DLR2416's internal character decoder to generate a substantially extended set of characters, including lowercase, accented, and umlaut letters not available in a standard 2416. 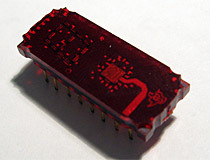 The 5082-7107 is a large, high quality red LED bitmapped display, manufactured by Hewlett Packard. 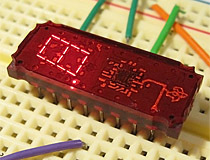 The display contains a five digit array of discrete LED dies and has no internal logic or controller; rows and columns must be manually selected and multiplexed to display a character. This display is extremely ruggedized - the white ceramic package, glass cavity lid, and all gold construction make it an impressive example of military-grade LED display construction. 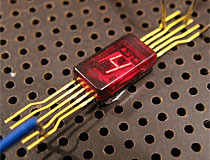 The AEL4004 is a obscure model of LED display with an early style of construction. 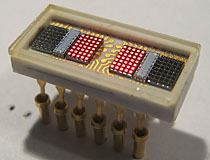 Each digit is made up of an individual LED die, which has been mounted to a piece of white ceramic and encased in a plastic boat with gold leads. This display is extremely small for a 6 digit alphanumeric device; the digits are only 3mm high and the entire display is 26mm long... only slightly larger than a standard 18 pin DIP. Strangely, the package has not been designed for symmetrical side to side mounting, as there is a large border of 'dead space' on either side of the display ceramic. 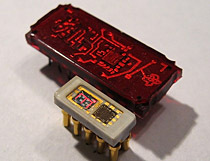 This probably contributed to the AEL4004's lack of success in the market, as the primary driver of LED production in the early 1970s was for use in pocket calculators, which require displays that can be mounted side-by-side in multi-package arrays. The example shown here was produced in 1974. The 3LS340A1 at first glance appears to be a Soviet analog to early US-made bitmapped displays like the MAN2. However, this Soviet display comes with a twist; each of its LED dots is not made from a separate die. 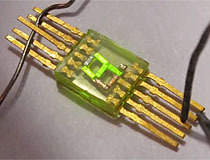 Instead, a single semiconductor 'sliver' die is used for each horizontal 5-dot row, allowing the entire device to be manufactured with only seven dies. This likely made assembly of the display much easier, though it probably increased the number of 'dud' dies that had to be discarded during the manufacturing process. One semiconductor bar in each display has been produced with an extra die, to provide the display with a built in decimal point. 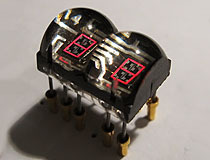 Much like early Monsanto displays, the 3LS340A1 was made in both clear and red encased versions; the red version is shown here. The plastic encasement is a hollow cap, which is bonded to the ceramic wafer containing the LED dies and pins. A noteworthy complexity introduced by the use of mulit-dot LED sliver dies is that individual LED dots can not be binned by brightness beforehand to produce a consistent brightness between all dots in a character. In an effort to mitigate this, each dot is connected with a pair of redundant bond wires, which helps to even out brightness irregularities when multiple dots are lit at once. Special thanks to Stan Skowronek for donating this unusual part. The Hewlett-Packard HDSP-211x is a family of eight-digit, 5x7 bitmapped character LED intelligent displays with full 7-bit ASCII, 16 user-definable characters, daisy-chainable master clock, internal oscillator option, multilevel dimming and blanking, and full read/write operations. Hewlett Packard's HDSP-20XX is an intermediate device, an evolutionary step between purely 'dumb' character displays like the Monsanto MAN-2A and full-featured smart displays like the DL-1414. All control schemes for large strings of 5x7 LED matrix arrays rely on heavy use of shift registers to store the bit patterns being displayed on the device; the 20XX takes the step of moving those shift registers into the display itself. There is no internal character driver or latch on this display, the controlling system must laboriously shift bitmap data into the display, 28 bits at a time. Like columns across each digit are tied together and row data from each column is shifted to adjacent digits instead of adjacent columns, all this results in an exceptionally tedious display to control. Like most high end HP displays, the 20XX series was manufactured in a range of LED colors. 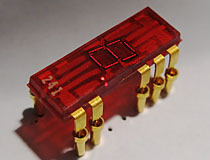 It should be noted that the HDSP-2010 and -2030 are among the few displays ever made to use a red glass and ceramic package. 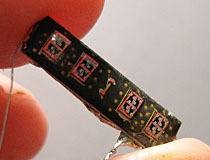 Most similar displays of this era are manufactured with much cheaper red epoxy. 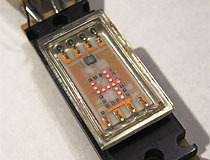 Though the West produced single die segmented LEDs in both strip packages for calculators as well as alphanumeric smart displays like the DL2416, single die 5x7 LED arrays remained elusive. 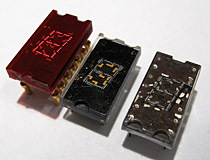 Early LEDs like the 5082-7000 used manually placed individual dies for their complex bitmapped numbers and their modern descendants continue to use individual dies for each dot, though the dies are now placed electronically. HP researchers long suspected that single die bitmap displays would be almost impossible to produce, due to the porous and conductive nature of the mask layer material. This difficult problem was overcome however, in Soviet devices like the IPV72A-4/5x7. Though at first glance the IPV72A would appear to be a bulkier clone of the Western HDSP-2000, a closer look reveals something much more interesting. Each digit in the IPV72A is constructed out of a single die, with 35 separate LED dots formed into its surface. 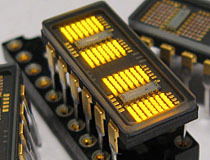 The manufacturer appears to have solved the diffusion problem through an additional mechanical process; each vertical row of LEDs has had a trench milled or etched alongside it to isolate it from adjacent rows. 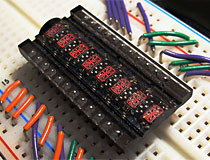 Bond wires are then installed in the normal way to connect each horizontal row, with the single die providing perfect placement of each dot relative to the others in each character. Manufacturing dies of this size without any defective dots is undoubtedly challenging, and it is unknown how long it took Soviet engineers to perfect this process. Electrically, the IPV72A-4/5x7 is a feature and pin compatible clone of the HDSP-2000 and other HP 16 pin shift register displays. This display can be dropped into most HDSP-2000 based circuits without any modification, but the package dimensions are slightly larger in both dimensions, which must be factored in when preforming a conversion. The HCMS-3966 is a step along the trend in the evolution of LED smart displays, designed for a world of programmable microcontrollers where no factor holds more weight than reducing the number of I/O pins needed to control a device. The HCMS-3966 is a 3.3 volt compatible serial display that works much like the earlier HDSP-2xxx devices, in that it has no character driver and data is directly shifted into registers that represent the LEDs in the 5x7 display matrix. Unlike the tedious to control HDSP-2xxx devices, the registers in the HCMS-3966 shift bits in a logical manner from right to left, making it much easier to shift data into the device. Unfortunately the 3966 is a much less TTL friendly device than the HDSP-2xxx; a built in brightness register is set to zero by default, and can only be changed by clocking in the correct serial data word into the appropriate control register. This is one device that can not be clocked and tested manually with pushbuttons. 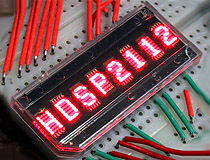 The 2-digit DL44M is a fairly typical Litronix display, with a clear epoxy package and gold leads. Even with only two digits, the 12 lead package for the DL44M lacks enough pins for direct drive and each digit must be mulitplexed. The DL44M's tiny single-die LED elements are made visible by ludicrously oversized, anatomically suggestive magnification lenses. 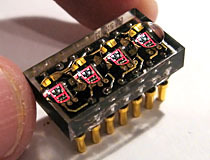 Most Western manufacturers abandoned the multiple die style construction of the Monsanto MAN-3 before a viable green LED chemistry was developed; nearly every LED calculator in the world uses red LED displays. The Soviets were one of the few groups still manufacturing transparent single-die 7-segment LED's at the time green LEDs were commercialized, and as such this Soviet-era MAN-3 clone is a strange beast: a green LED constructed in classic vintage single die style. The display is very nearly the same size and shape as a Monsanto MAN-3 and contains seven elongated dies for the segments and an eighth square die for the decimal point. The dies are not divided into multiple active 'dots' as in other displays of this construction style. Instead, the entire surface of the die emits light. The LED package is almost perfectly clear and the ground plate is cut to match the shape of the segments, which gives these displays a striking transparent appearance not shared by other vintage LEDs. This unusual device is a tiny surface mount LED display with a twist: a built in magnifier. 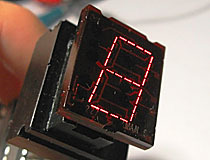 This device can display normal seven-segment characters and has a decimal point indicator, but lacks the second ground contact common to other displays of this general form. 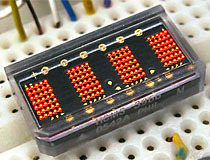 The leads on this example are clipped, but it is likely that the display originally had quad inline leadforming based on the way the contacts have been clipped. Digit height on this display is only 1.5mm and the tiny, vaguely comical built-in magnifier lens does little to improve the size of the displayed digit. We have no idea who manufactured this strange LED, but suspect from the construction style that it was probably made by Litronix. The MAN2185 display is a multidigit alphanumeric display manufactured by Monsanto. 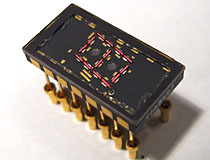 Like many other early displays that contain multiple digits, each digit of the 2185 is made of a single die of wafer material, as opposed to being assembled of individual dots or strips of LED material like the MAN-1. Despite appearances the MAN2185 does not actually have full 17 segment characters, both center segments are ganged together to reduce the amount of wiring needed for each die. Unlike many other displays of this type, 2185 is a manually controlled device, with no onboard character ROM or driver circuitry. 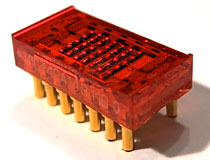 Litronix manufactured a second-source version of this part, the DL2185. 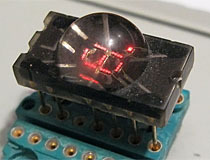 The DL2185 is nearly identical to the MAN2185, but replaces the linear magnifier of the Monsanto display with discrete bubble magnifiers for each digit.